We actually make fundraising FUN! Tired of selling candy and pizzas to your co-workers to earn money for your charity or child's sports team? Sully's has the solution, and best yet, it doesn't cost you a single out-of-pocket dollar and we do nearly ALL of the work. It's true! Come out for a fun evening, leave with a smile on your face and fat cash for your charity or group! The average ticket price is $15; thus, a $7.50 profit for each ticket sold. There are additional options for ticket pricing. Call or email Annemarie for details at 443-928-1431. Ask about our all-inclusive fundraiser which includes all of your sodas, coffee/tea and alcohol! By the way... the tickets sold to your fundraiser are good for 3 months after the event. In other words, if something comes up and someone can't make it, they can use their ticket for 3 months at any Friday or Saturday night show not identified on our website as a "Special Event". It's also handy when selling tickets! If a perspective ticket buyer says they are "busy" the night of your fundraiser, you can tell them it's not a problem because they can still support your group by purchasing tickets and see another show! And it doesn't cost you a single out-of-pocket dollar. 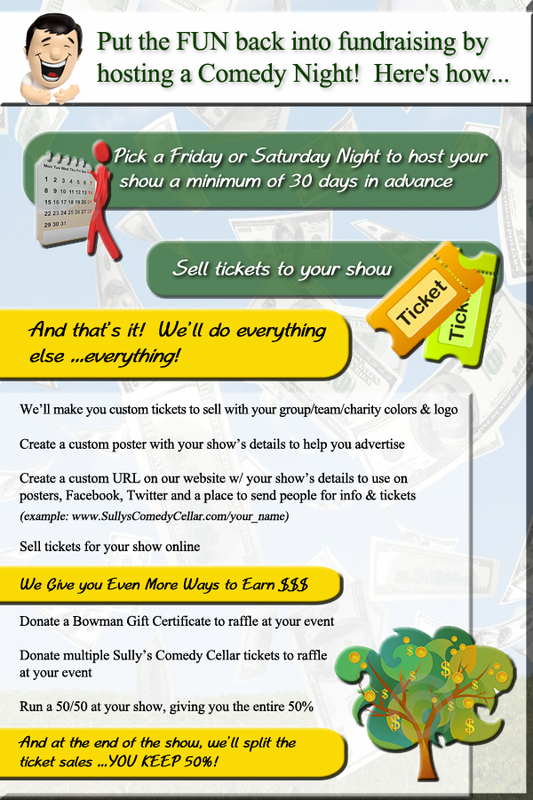 The only money you'll give us is 50% of the ticket sales after the completion of your show. Let's make your fundraiser a huge success...without peddling pizzas, candles and candy!